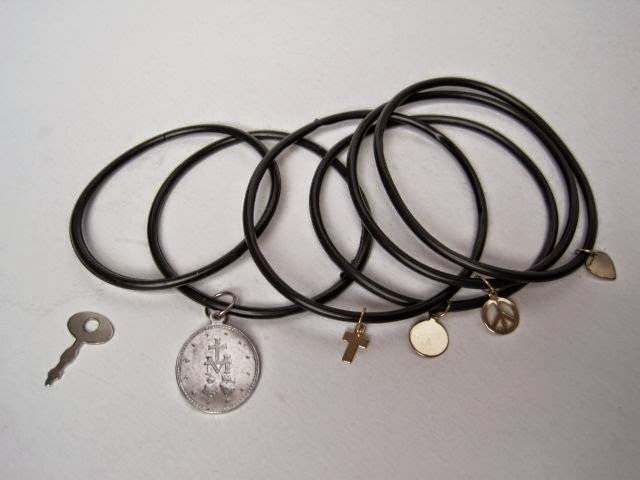 South Africans love wearing black rubber O-Rings as bracelets. I was given a few by a girl in my yoga class that I wear from time to time. Recently I saw some on sale at River Island with cute little charms. I bought them straight away and promptly added charms to my rubber O-Ring bracelets. Well not exactly charms. One is a key I found on the street and the other is a Catholic medal I’ve had for yonks. The medals are easy to find in Catholic bookshops. I like that they have saints with special powers associated with them. See them here. O-Rings are also easy enough to come by. You can usually buy them from a hardware shop or do an on-line search for your local supplier. See them here. So all you do is attach your charms to your rubber O-Rings with some metal jump rings and you’re done! Here is an older post with more ideas – use this link – and how cool is – this – project? Visit the Greenie Galleries at the top of this page for more ideas to make your own. And you can share your DIY’s or just give Greenie a ‘like’ on the Greenie facebook page. LOVE your ideas. Hopefully I will have even a fraction of your talent so I can try them! Yay! Found you through the Meet&Greet! I look forward to receiving your posts in my feed and twitter updates.